At seventeen, June Hardie is everything a young woman in 1951 shouldn't be--independent, rebellious, a dreamer. June longs to travel, to attend college and to write the dark science fiction stories that consume her waking hours. But her parents only care about making June a better young woman. Her mother grooms her to be a perfect little homemaker while her father pushes her to marry his business partner's domineering son. When June resists, her whole world is shattered--suburbia isn't the only prison for different women. June's parents commit her to Burrow Place Asylum, aka the Institution. With its sickening conditions, terrifying staff and brutal "medical treatments," the Institution preys on June's darkest secrets and deepest fears. And she's not alone. The Institution terrorizes June's fragile roommate, Eleanor, and the other women locked away within its crumbling walls. Those who dare speak up disappear...or worse. Trapped between a gruesome reality and increasingly sinister hallucinations, June isn't sure where her nightmares end and real life begins. But she does know one thing: in order to survive, she must destroy the Institution before it finally claims them all. June is content with staying in her room and writing all day. Her mother has other plans. In order to make June into a perfect woman, she must learn how to cook, slave over her brother’s and dad’s every whim, and fall in love with a financially stable man. Obsessed with writing her alien abduction story, June plans to escape and live the way she wants. However, when her escape turns sour, her parents send her to an awful asylum. And nothing is as it seems. All June ever wanted was to be free. Nightingale is a crazy whirlwind that will leave you shocked. Going into Nightingale, I was expecting ghosts or other paranormal activity, leaning more towards the horror genre. Instead, Nightingale is more of a science fiction, delving into the unknown. Nightingale is extremely compelling. Science fiction has never been my favorite but this page turner has a way of gripping you right in. The 1950s setting gives the book the perfect atmosphere. Lukavics explores extreme gender roles. Nightingale will be sure to start discussions when June’s mother explains her desire in making June the perfect woman. All June wanted was to escape suffocating societal rules, gender roles, and doing what's always expected of her. She doesn’t want a future that's already mapped out for her, on the road to becoming the perfect woman, the perfect wife. 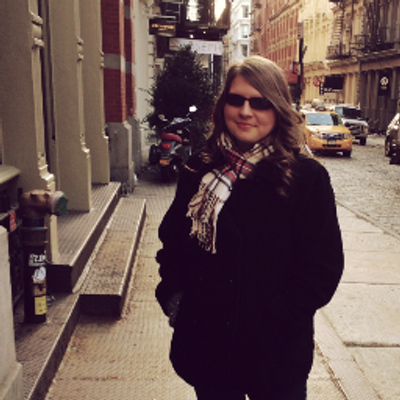 She’s the type to color outside the lines and readers will absolutely love her narrative. 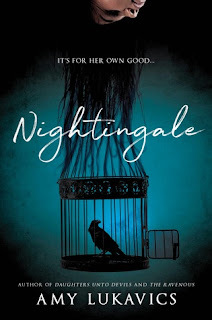 Nightingale is a YA Shutter Island. With monsters in dark tunnels and things pretending to be humans, Nightingale is sure to haunt both your waking hours and your dreams. June is an unreliable narrator of the best kind. She constantly doubts her actions, her thoughts, and even her own eyes. Readers will trust June in her assessment one moment and the next, shaking their head at the absurdity of it. The book messes with readers’ minds. Readers will not know what to think. It does showcase a female/female romance which is appreciated. However, since the relationship is not the main focus of the work, it seems underdeveloped and superficial. Amy Lukavics is an incredible writer. The careful structure of the book mixes with the imaginative descriptions that jump off the page. Lukavics takes readers back and forth in time, explaining June's present life in the asylum and her past, leading up to the asylum. Despite sounding a bit confusing, the structure is quite brilliant. Lukavics only reveals so much at any given point, leaving readers curious to know more. The descriptions are cringe worthy, gruesome even. June becomes obsessed over writing detailed torture scenes of her own protagonist. It gets quite gory. If you are a queasy reader, this one may not be for you. The ending leaves something to be desired. It took a direction no reader will foresee. However, this unpredictability quickly turns unbelievable and too ridiculous. Nightingale was gruesome, undeniably entertaining, setting a terrifying atmosphere you will definitely want to read during autumn. OOh nice! I've only read one of Amy's books but I have at least one other in my TBR pile! I think I held off on her release from last year because I was trying to do the whole "read what I have" thing! Lol! This one sounds creepy and twisted! Love those kinds of reads! The ending has me curious now and I'm already trying to formulate guesses without having picked it up yet! Lol!